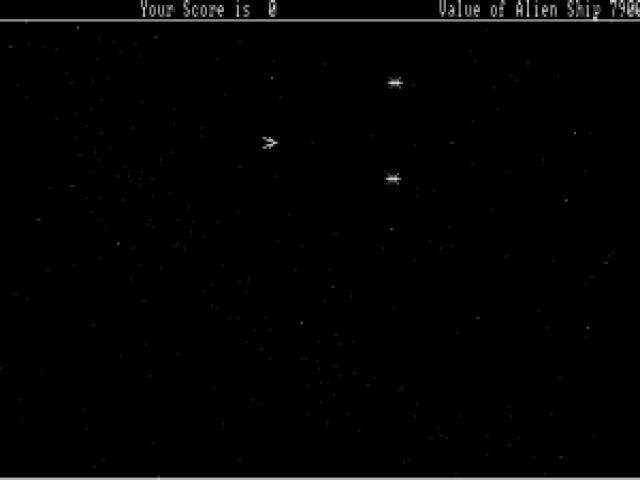 As you might expect from the title, Kamikazi Alien is a space shooter, much like arcade classics such as Space Invaders and Galaxian. It's less than a must play, offering as it does little in the way of innovation or imagination, but if you like your shooters simple and old-school, then you might find some enjoyment here. As usual with this kind of thing, there's little to the game other than being a mere exercise in high score chasing, with little in the way of story to get in the way of the action. You simply have to guide your little spaceship around, blasting aliens in order to rack up the points. You have two weapons at your disposal, the ubiquitous plasma gun, as well as a limited supply of smart bombs for when the situation gets really desperate, and the quicker you take out the bad guys, the more points you get. In all honesty, that's pretty much there is to say about the game in terms of gameplay and it simply consists of blasting away until you run out of time or patience. Visually, this is less than stellar stuff, and lacks even the charm and character of the best of the early classics, consisting merely of a few very basic and rather samey sprites and nothing in the way of backdrops. However, if you can get past this, there is a solid, if simple and repetitive, shooter to enjoy here. If you like to see your name on the high score table then that's what this is all about so if you have a few spare minutes on a dodgy Sunday afternoon, then by all means give this a whirl. Just don't expect to be playing for very long.